Many of us have logged onto an online poker site for a quick 10-15 minute session, but in what may go down as the most memorable 1/6 of an hour Tom Dwan was able to relieve Patrik Antonius of over $230,000 in just 9 minutes! The session puts Dwan’s lead in the “Durrrr Challenge” $1.9 million after 33,303 hands. Patrik Antonius is definitely running out of time, and seems to be going deeper and deeper in the hole as of late. 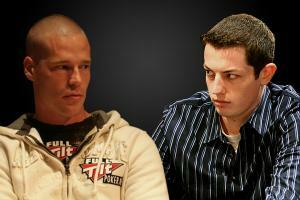 If after 50,000 hands Antonius is on the losing side he will have to pay Tom Dwan an additional $500,000. On the flipside, if Antonius can somehow make a $2 million comeback Dwan would owe the Finnish superstar $1.5 million. With 17,000 hands virtually anything can happen, but every hand dealt is making it more and more likely that Dwan will emerge victorious. This entry was posted on Tuesday, March 16th, 2010 at 1:08 pm and is filed under Poker News. You can follow any responses to this entry through the RSS 2.0 feed. You can leave a response, or trackback from your own site.